There are 2 cat videos tagged with duck. Is it possible to write the Jaws theme music down into words? No? Well there should be a way. If only all villains could travel by Roomba. I’m picturing the Wicked Witch of the West wandering across Oz screaming “I’LL GET YOU MY PRETTY — AND YOUR LITTLE DOG TOO!” while clocking at 2 miles per hour. 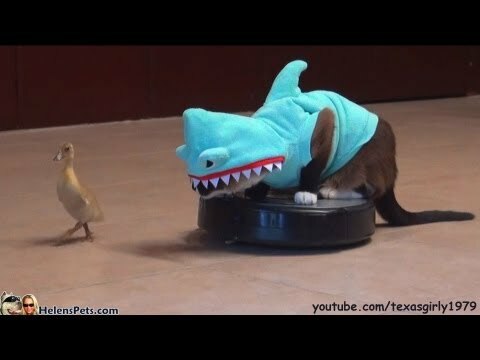 There isn’t any giggling in the background, no commentary, just pure comedy gold as two pets wander around in silly shark costumes. I dub thee video to be called Paws: Terror from Home Shopping.